Team building starts at the base of the pyramid and seeks to build trust among your team members. Is my team dysfunctional? Is team building the answer? Teams can fail for any number of reasons, and author Patrick Lencioni seeks to categorize and explain each of these in his book The Five Dysfunctions of a Team. Lencioni uses a pyramid model, as you can see to your right, to better illustrate his point. Each tier builds upon the failures from the one below, leading up to one thing: failure. These issues affect not only sports teams, but also corporate teams, scouts and youth groups, and more. 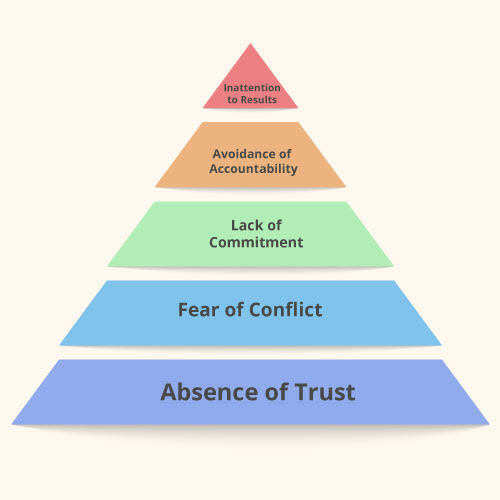 Absence of Trust: The base of the pyramid is the absence of trust. After all, a team without trust is not much of a team at all. If you do not trust the person next to you, you will never be open and honest with them, which leads to No. 2. Fear of Conflict: Conflict is all around us, but that is not necessarily a bad thing. When conflict leads to debate, some pretty amazing things can happen. Unfortunately, without trust, members of a team are afraid to be vulnerable with one another and will never enter into constructive debate, instead opting for artificial harmony. Lack of Commitment: Fear of conflict breeds uncertainty, which leads to a lack of commitment throughout your team. Avoidance of Accountability: Without commitment, there is no accountability. There is no one to confront team members and call them out for activities detrimental to the overall team. Inattention to Results: At the top of the pyramid is an inattention to results. This is the stage where individuals stop trying to succeed as a team. It boils down to one thing – selfishness. Team members would rather focus on personal success than team success. As Abraham Lincoln famously said, “A house divided against itself cannot stand.” Once this tier is reached, a team cannot function properly without first addressing these five issues. Team building starts at the base of the pyramid and seeks to build trust among your team members. Presented in a fun and creative way, team building exercises challenge your group to step out of their comfort zones and encourage them to work together to solve certain tasks. These simple exercises help break down communication barriers and foster trust, which will, in turn, help drive productivity and promote teamwork. Terrapin Adventures is conveniently located in Howard County, Maryland, between Baltimore and Washington DC. Our custom team building programs are designed to improve communication and cohesiveness among your employees. This entry was posted on Wednesday, June 24th, 2015 at 4:22 pm. Both comments and pings are currently closed.